Late last week we finally got around to putting up some holiday decorations in the library. We put up a tree, and wrapped Mr. Mellon, our library's namesake, in a scarf and put some silly antlers on his head. Then, on Tuesday afternoon, a group of kids were clowning around near the statue. I looked over at them from my desk, at one point, and noted that a girl was wearing Mr. Mellon's antlers. But I didn't say anything. I let them have their fun. A few hours later, when I was locking up the library at 5 p.m., I noticed the antlers were gone. Now, this may seem like a minor matter, and I suppose in comparison to Brexit or Trump or climate change or any of our other global disasters, it was. But I vowed that this desecration of our holiday shrine would not stand. I sent out a firmly worded e-mail to the students involved, making plain that I expected the antlers returned or else. So all's well that ends well. I shall speak no more of it. Putting Antlergate aside, we had a busy day in the library yesterday. Some carpenters arrived in the late morning to dismantle our DVD cabinet, with extraordinarily bad timing, given that we were hosting several classes doing research. Everyone coped, but the kids sent eye-rolling glances toward the workers whenever they fired up a drill or even -- once -- an electric saw. It's a bit Charlie Brown-ish, leaning to one side, but we like it. We had the middle school kids produce star-shaped decorations bearing recommendations of their favorite books. Kind of a cool idea, I thought! (I cannot claim credit.) We then put the recommended books on a shelf beside the tree and around its base. Some of the kids recommended typical middle school stuff, like "Diary of a Wimpy Kid," while some went for more sophisticated fare -- Sheryl Sandberg's "Lean In" and Yuval Noah Harari's "Sapiens," for example. Some serious readers, here! Or at least aspirational ones. Andrew Mellon must be turning in his grave. 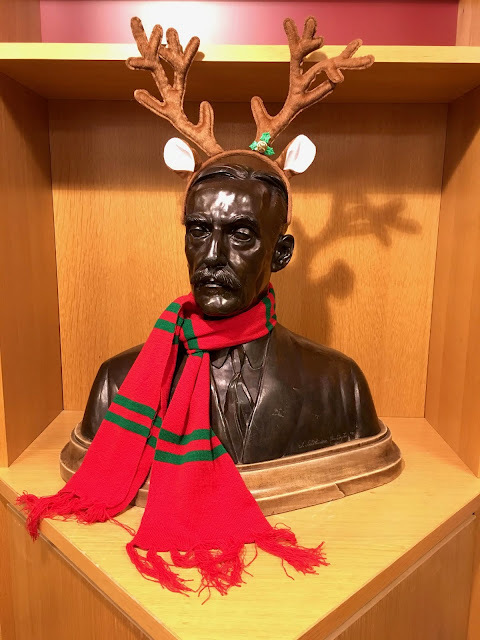 How distressed his proud descendants would be if they learnt that his beautifully crafted bust had been donned with tacky Christmas antlers and a scarf! Good grief! Next you'll be hanging baubles from his ears! Nice note from that kid. Or his or her parent. I suspect the latter. The Case Of The Mysterious Disappearance Of The Antlers In The Library. And I think that the idea about the book recommendations on Christmas tree ornaments is pretty darn cool. Yesterday, Tom Stephenson wrote about the "yoof" of today having such bad manners, but here you have an example of something about today's youth that really bugs me. 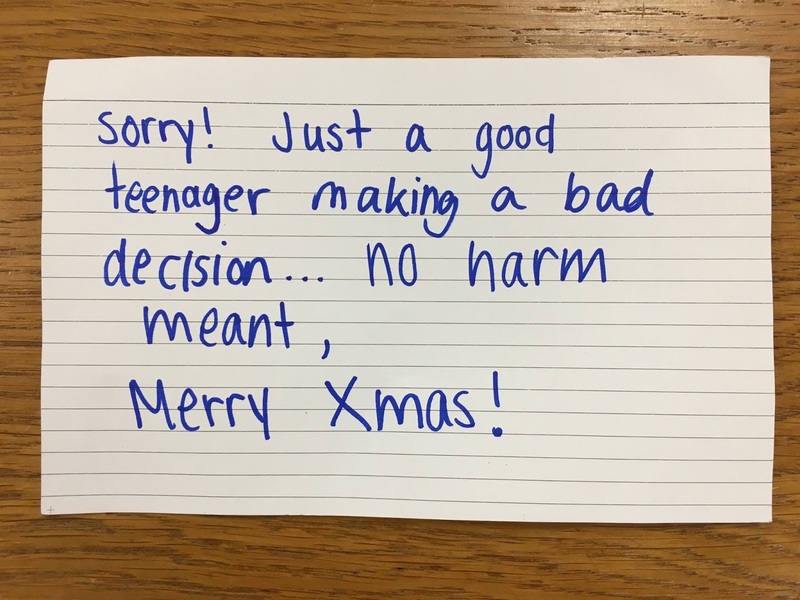 This whole thing of being a good person who makes bad decisions.When did that become a thing, excusing bad actions as merely being bad choices, and then exonerating the actor or one's self for those actions under the mitigation of its being merely a "choice"? To me, there is no difference between a good person doing a bad thing and a bad person doing a bad thing. The harm is no less real, the action is no less offensive. OK, boosting the librarian's Xmas antlers is a very minor "bad choice", but I heard the same language come from a mother whose son had several previous DUIs, had got drunk, driven a car the wrong way on the Long Island Expressway, ran into a limousine carrying a wedding party, and killed the limo driver and decapitated a five-year-old flower girl (and this is the story with me withholding the more gruesome details). Yes: the mother said that her son was not a monster, he was just a troubled boy who made bad choices. I want the "good people making bad choices" plea to go away. Only dirtbags steal stuff. I want to know what the 'or else' was going to be. and it's good you didn't let the perp get away with it. it would have been easy to blow off but that sets a precedent and next time the lifted item might be from a store. You librarians can always work books into a situation. good for getting kids to make the selections. I like Mr. Mellon and his antlers and that note is priceless. I also like the tree and the decoration idea was brilliant. I love how you handled Antlergate and got the antlers back and that note. Good job. The Christmas tree decorations are wonderful! Those kids really have a great library and librarians. The stern librarian wins again! Good post, Steve. I like the idea for the Christmas ornaments/books theme. A good way to incorporate your mandate into the season. I wish the library at my school had been as much fun as your library sounds like! But then, my school library days were about half a century ago! I love your Christmas story -- the return of the antlers was the library's Christmas miracle!